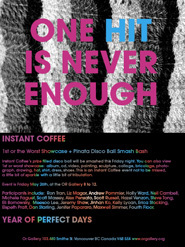 Instant Coffee's prize filled disco ball will be smashed this Friday night. You can also view 1st or worst showcase: album, cd, video, painting, sculpture, collage, bricolage, photo- graph, drawing, hat, shirt, dress, shoes. This is an Instant Coffee event not to be missed, a little bit of sparkle with a little bit of tribulation. Event is Friday May 26th, at the OR Gallery 8 to 12. Participants include: Ron Tran, Liz Magor, Andrew Pommier, Holly Ward, Neil Cambell, Michele Faguet, Scott Massey, Alex Pensato, Scott Russell, Hazel Venzon, Steve Tong, Eli Bornowsky, Meesoo Lee, Jeremy Shaw, Jinhan Ko, Kelly Lycan, Erica Stocking, Elspeth Pratt, Dan Starling, Jenifer Papararo, Maxwell Simmer, Fourth Floor.